Tanglefoot is poem 4 on the Westonbirt Arboretum Autumn Trail 2017. The audio version of this poem was read by Amy Robins. From the collection 'Conversations with Trees'. When I saw the horse chestnut, I fell in love. This old playful tree had spread its roots and looked as if it was wandering. The theme for this poem was playfulness. Even when we are tethered, we have freedom; when we are rootless, are we free? This dipping of branches into and out of the earth is called 'natural layering'. This is when branches touch the ground and give adventitious roots. This made me laugh, to hear this horse chestnut's roots were, indeed, adventurers. I was inspired by Khalil Gibran's quote "You will be free indeed when your days are not without care, nor your nights without a want or grief, but rather when these things girdle your life and yet you rise above them, naked and unbound." I saw how this tree pushes on through the soil to fill the earth with its joyful shape. Pablo Neruda says (asks), "Why do trees conceal the splendour of their roots?" but this tree does not. This tree became 'Tanglefoot' and will always be an adventurer. When I sat with Tanglefoot, I saw the shadows all muddled; (a pattern,) a negative photo on the earth. I had read Gerard Manley Hopkins and seen his wonderful blended words like 'shivelight' and 'silk-sack clouds', and I too love wordplay so invented 'shadowspill' and 'tumblefull'. I also made up 'thudburst' which is onomatopoeic as I heard the spike-crusted fruit drop. I wanted the words to fall like the leaves and loved the rhythm of "amber, umber, honeyed gold". I give credit to Siegfried Sassoon for inspiration for my line, "Trees, who unwhispering stand umber, bronze, gold". 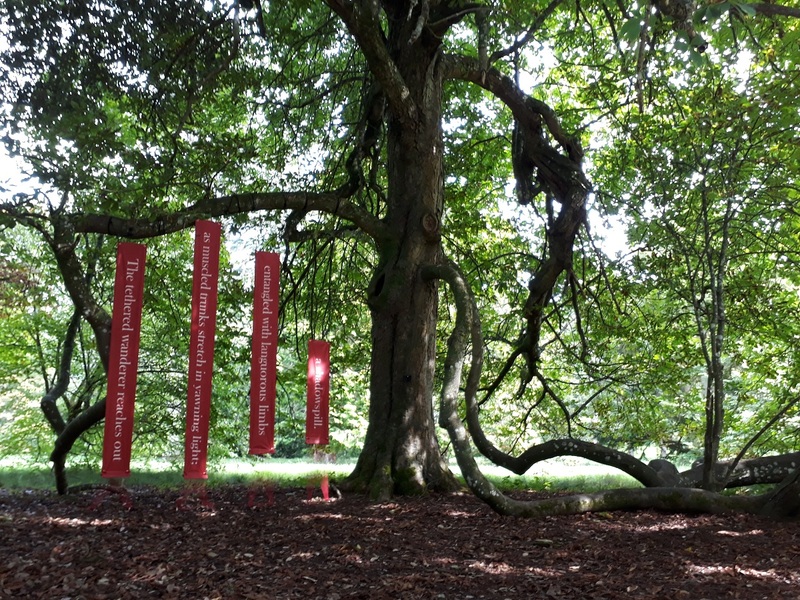 I saw how children climbed over the trunks and wanted to have this in my poem: the last stanza was, "Buckled shoes clamber on bedded trunks/ playful" but Westonbirt did not want to encourage clambering! So I changed the last stanza and was glad I did: conkers are such a rite-of-passage for school children. My last stanza being “Remember battles: the miss then clip, click, split/ of conkers, playful”. Robert Southey, poet laureate from 1813-1843 made the first recording of the game "Conkers" in 1820. “what wind-walks”, “silk-sack clouds” – Gerard Manley Hopkins, Hurrahing in Harvest. “An elm arches, shivelights and shadowtackle” – Gerard Manley Hopkins, That Nature is a Heraclitean Fire and the comfort of the Resurrection. “Of serious colour clad confront me with their show… Trees, who unwhispering stand umber, bronze, gold” – Siegfried Sassoon, October Trees. “Oh chestnut tree, great rooted blossomer, Are you the leaf, the blossom or the bole?” – WB Yeats, Among School Children. “Under a spreading chestnut tree/ The village smithy stands… with large and sinewy hands” – Henry Wadsworth Longfellow, The Village Blacksmith. “they take delight in your bountiful shadow; and as they grow they will lean towards you, and wind around you” – Charlotte Brontë, Jane Eyre. “When showers betumble the chestnut spikes” – Thomas Hardy, Weathers. Conkersations: Most people recognise the spreading horse chestnut (Aesculus hippocastanum). Who hasn’t rushed to find the odd conker or ten? Historically conkers have had many uses besides being threaded on strings. Some think 'horse' comes from the Welsh gwres, meaning fierce; a reference to the nut’s bitterness. This is due to a soap-like chemical known as aescin - ground nuts were once used for whitening linen. Aescin also aids the treatment of varicose veins and haemorrhoids, helping to reduce swelling. Starch-rich conkers were also collected in World War One to make acetone, an ingredient for making the cordite used in artillery shells. The MOD even recruited children to collect nuts for the top secret project!